The Everest three high passes Trek with Everest base camp is an extreme trek in the Khumbu region. 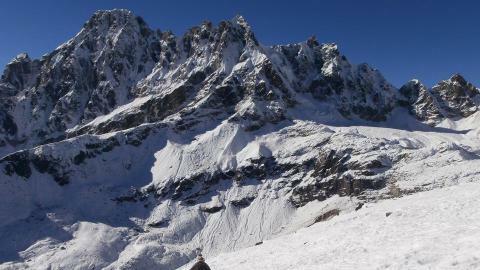 It combines the most thrilling passes Renjo La (5388m), Cho La (5380m) and Kongma La (5535m). 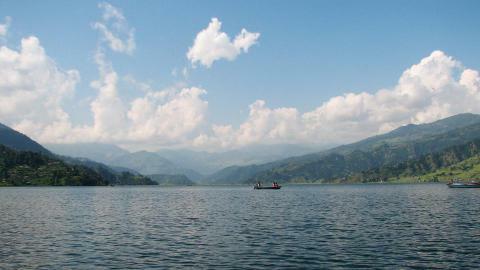 This trek is suitable for those who want an extra challenge and a real Nepal adventure. There is no doubt that the trip covers all the views of the Everest region, glaciers, frozen Lakes, alpine Sherpa settlements, Mt. Everest sunrise views and the Sagarmatha National Park. Himalayan flora and fauna are other rewards of this trek. After a short and superb flight to Lukla from Kathmandu, the three passes Trek begins. Walking along the Dudh Koshi River, it enters into the Sagarmatha National Park, which extends up to the highest altitude of the world. Namche Bazaar, is the central market place of the Khumbu region and a busy settlement. It is filled with ancient sherpa settlements and also the offers beautiful views of the mountains. A day rest in Namche Bazaar helps trekkers to acclimatise in the higher altitude to prevent altitude sickness. 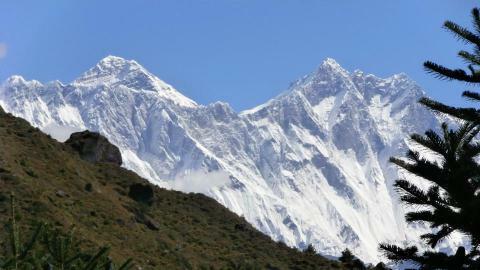 Renjo la pass on the following day after Lungden, provides dazzling views of Everest and other mountains in the range. 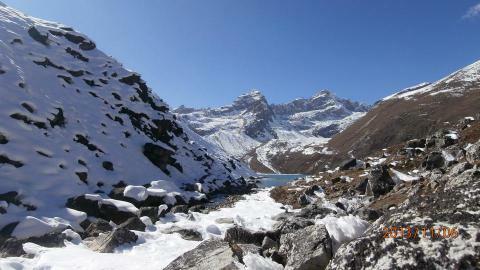 We then descend to the Gokyo valley, also known as death valley, which is located beside the Dudh Pokhari. A day hike to the Gokyo RI offers astonishing panoramas and the views of the Everest five Lakes and Ngozumpa Glacier. As we cross over the Chola-La pass (5420m) to go to Everest Base Camp, the views include Pumori, Nuptse, Lhotse, Mt. Everest, Cho Oyu, Makalu welcomes us with its white smile. After visiting Everest base camp and Kalapatthar, we descend to cross the Kongma La, the highest Pass of this trek. The views are outstanding from top of the Kongma La Pass. We spend a while here before descending to Tengboche and then Lukla, the starting point of the trek. The lush vegetation and alpine flora like rhododendron, oak, birch are bonuses to chosing this trek. A leading trekking company, Namaste Treks offers well managed trekking packages with the required equipment, experienced guides and well looked after porters. We are aware of the risks of high altitude sickness, and so follow safety measures and proper acclimatisation days. Please, contact us for detailed information. A challenging cross to the Everest three high passes. Awesome Everest Himalayan vies of Mt. Everest, Nuptse, Amadablam and others. Explore Sherpa culture, traditions and monasteries. Day 02: Kathmandu Sightseeing and climbing trip Preparation. Day 06: Namche Bazaar to Thame (3800m): 4 - 5 hrs. 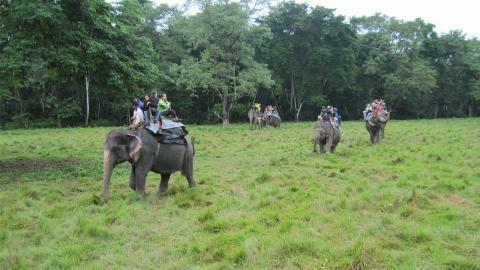 Day 07: Thame to Marulung (4210m): 5 - 6 hrs. Day 08: Marlung to Lungden (4380m): 2 - 3 hrs. Day 09: Lungden – Renjo La Pass (5360m) - Gokyo (4800 m): 8-9 hrs. Day 10: Hike to Gokyo RI (5357m). Day 11: Gokyo to Thaknak (4750 m): 5-6 hrs. Day 12: Cross the Cho-La Pass and trek to Dzongla (4830m): 7- 8 hrs. Day 13: Dzongla to Lobuche (4940m): 4-5 hrs. 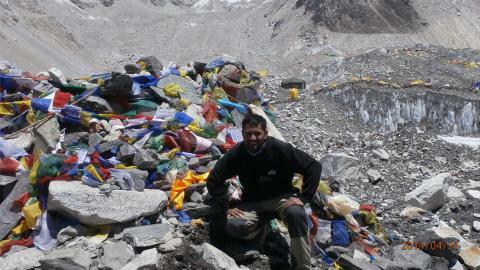 Day 14: Lobuche to Gorak Shep (5170m) - Everest Base Camp (5364m) - Gorak Shep: 8-9 hrs. Day 15: Hike up to Kala Patthar (5545m) and back to Lobuche (4940m): 7-8 hrs. Day 16: Climb up the Kongma La (5535m) and trek down to Chhukung (4730m): 6-7 hrs. Day 17: Chhukung to Tengboche (3860m): 5-6 hrs. Day 18: Tengboche to Namche Bazaar: 5-6 hrs. Day 19: Namche Bazaar to Lukla (2800m). 6-8 hrs walk. Day 21: Rest Day and Shopping in Kathmandu. After breakfast, we set off for the Kathmandu city sightseeing tour. We visit the famous Hindu and Buddhist monuments, listed as UNESCO world heritage sites. 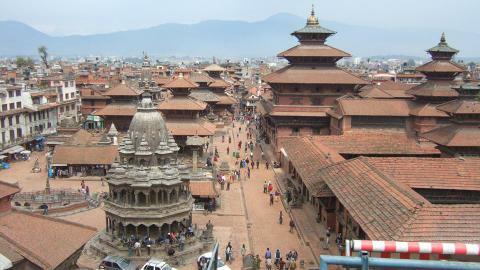 They are Pashupatinath (the great pilgrimage site for Hindus), Bouddhanath (Buddhists’ Stupa), Swoyambhunath (Buddhists’ Stupa) and Kathmandu Durbar Square (where the living goddess lives). Then back to the hotel to prepare for the trek. O/N at Hotel. We fly to Lukla from Kathmandu early in the morning. After arriving in Lukla, we head towards the Phakding, following the main trail above the Dudh Koshi River. We arrive at Phakding. O/N at lodge. Now we march off to the Sherpa Village - Namche Bazaar. The trail enters into Sagarmatha National Park from Jorsalle. It is a fantastic walk from here through the rhododendron and blue pine forest. O/N at Lodge. It is a day of acclimatisation. After breakfast, we set off to visit the surrounding area. 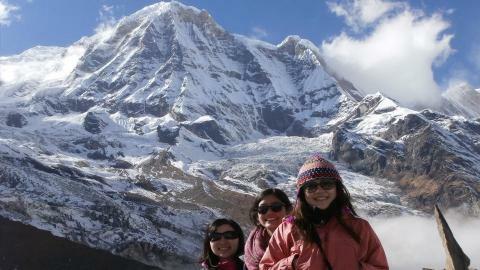 We reach the Everest View Hotel and see the dramatic views of Mt. Everest, Ama Dablam and Lhotse, before returning to Namche Bazaar. O/N at Lodge. After breakfast, we gradually ascend towards the Thame. This is an interesting walk and we see the beautiful surrounding mountain ranges. These are Kongde RI, Khumbi La and Kusum Kangde. We then descend to the Thame via Phorte Samde. O/N at Lodge. After breakfast, we trek higher through the barren landscape. Now the altitude increases and the walk becomes more difficult. Passing through villages, we reach the Marlung village. O/N at Lodge. Today, we gradually walk at higher altitude. There is frequent ascending and descending to reach Lungden. It takes about 2 hours. After lunch, we set off on a small hike near the village. O/N at the Lodge. Today, we cross the first high pass of our trip. The Renjo-La pass is an exciting cross with beautiful views of Everest Himalayas. After a long and thrilling climb, we descend to the Gokyo Valley. O/N at Lodge. We hike up to the Gokyo RI and have sunrise views over the Everest range. The views of sacred five Lakes, Ngozamba Glacier, Mt. Everest, Lhotse, Makalu, Nuptse, Cho Oyu and other Peaks. Then we back to Gokyo and rest. O/N at Lodge. After breakfast, we head through the rocky ridge of the Gokyo valley. Climbing through the Ngozumpa Glacier, we reach Thaknak. O/N at Lodge. Today, we have a technical climb all day. It is a steep climb along the Glacial route on the eastern side. From the beginning of the climb, we head along the rocky trail. From the top of the Cho-La Pass we can see Mt. Cholatse, Ama Dablam, Lobuche peak and others. Descending from there, we trek to Dzongla. O/N at Lodge. From Dzongla, we trek to Lobuche. Also a rugged trail, but the Himalayan views are superb. We reach Lobuche Village. O/N at Lodge. Day 14: Lobuche to Everest Base Camp (5364m) and back to Gorakshep (5170m): 6-7 hrs. Today, we reach Everest base camp via Gorakshep after a long walk. After taking some photographs, we trek down to our campsite at Gorakshep. Of course, the views are incredible. We can see climbers high on Everest waiting to summit. We rest and enjoy a hot meal at Gorakshep. O/N at Lodge. In the early morning, we hike up to Kalapatthar to view the sunrise over Mt. Everest. The climb is tough through the rocky trail. The breathtaking views from here are of Mt. 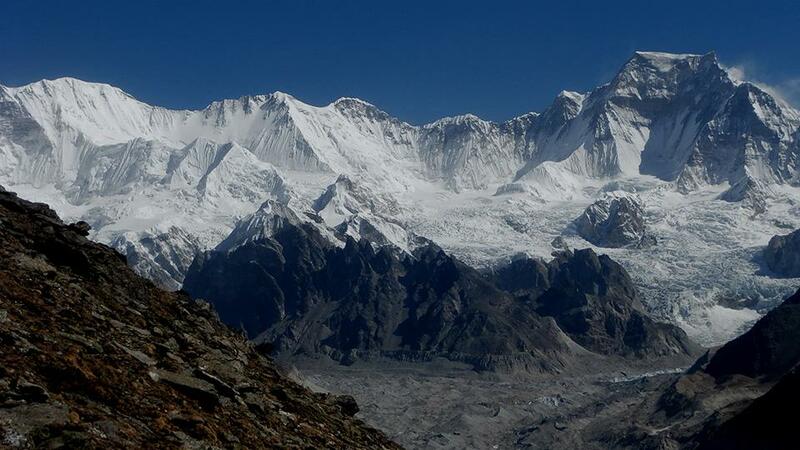 Everest, Khumbutse, Changtse, Nuptse and other surrounding Peaks and Glaciers. Then we descend to the Gorakshep, and trek on to the Lobuche. O/N at Lodge. Today, we cross the third pass of the three high passes. 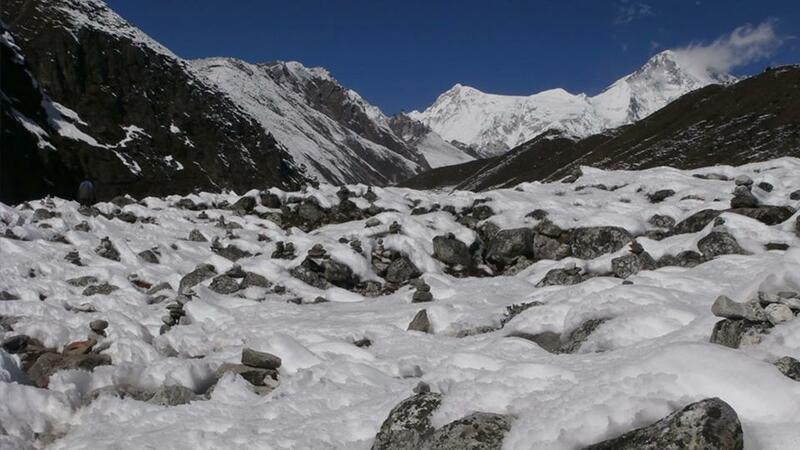 The Kongma La Pass is also a challenging pass and the highest pass in the Everest region. It offers wonderful views of the Nuptse, Ama Dablam, Makalu and others. 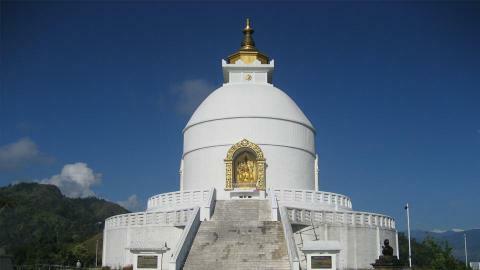 Then trek to Chhukung. O/N at the Lodge. Today, we trek towards Tengboche, which is a central attraction for the Buddhists. The trail goes through the Dudh Koshi River and we reach Pangboche. You can visit the monastery there and walk further to Tyangboche. O/N at Lodge. Day 18: Tyangboche to Namche Bazaar. After paying homage at the Tengboche monastery and breakfast at the lodge, we trek down to Namche Bazaar. It is a pretty easy trail, arrive at the Namche Bazaar and rest. O/N at Lodge. Day 19: Namche Bazaar to Lukla. After breakfast, we slowly trek down the side of Namche Bazaar and continue down to Phakding. We leave the Khumbu region and the Sagarmatha National Park. After about three hours walk along the Dudh Koshi River, we arrive at Lukla. O/N at Lodge. On our rest day after a long trip, we visit the local market and buy presents for relatives and family members. In the evening, we look around Kathmandu. O/N at Hotel. After a memorable trip we bid you farewell today. Our representative drops you at the international airport for your departure. Thanks for joining us. Note: Due to bad weather, flights can be delayed, so allow days either side of your trek.